At the 48th CIML Meeting in Ho Chi Minh City, Viet Nam, the fifth OIML Award for Excellent Achievements in Legal Metrology in Developing Countries was awarded to the Tanzania Weights and Measures Agency. Mr. Mason told delegates that this OIML Award had now been running for a few years, and, as delegates knew, it was a special award given to an individual or organization that had excelled in developing its legal metrology activities. He announced that this year’s award would be going not to a single person but to an organization: the Tanzania Weights and Measures Agency. Staff from the agency had developed a system for the control of prepackages in their country, which greatly improved consumer protection while at the same time improving the convenience of the system to traders. Previously in Tanzania, as, he was sure, in many other countries, prepackage controls had been undertaken at the legal metrology offices, and traders had had to take the time to go to these offices to witness tests on the samples of their products. This was a considerable waste of time for traders, and had also led to some doubts about the integrity of the test results. The Tanzania Weights and Measures Agency had therefore decided to take an innovative approach to this problem, and had developed a spreadsheet to enable a quicker assessment of test results in the field, so that decisions could be taken immediately and in the field. By taking a laptop computer and printer, a 10 kg scale and a pycnometer for determining the density of liquid products to the trader’s premises, the speed of inspection had been greatly improved and doubts as to the authenticity of the test results had been greatly reduced, since the whole process was followed in the presence of the trader. In the middle of the current year, the Tanzania Weights and Measures Agency had been presented with a prestigious award in respect of these activities, the “best accountable and transparent organization”, an award given during the African Public Service Week in Accra, Ghana. 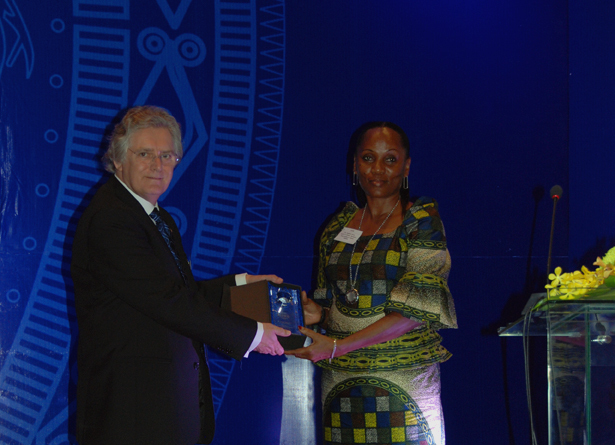 This was a week which showcased innovations in improved service delivery by public service organizations in Africa. The OIML was therefore very pleased that the CEO of the Tanzania Weights and Measures Agency, Mrs. Magdalena Chuwa, who was also the CIML Member for that country, was present at the meeting. Mr. Mason asked her to come forward to accept this OIML Award in recognition of the innovative work undertaken by her Agency. Mrs. Chuwa thanked the President for this wonderful recognition for her country and for her Agency. She said it was a real motivation for her and her colleagues to continue with their legal metrology work.